Just ahead of Independence Day, we look at made-in-India Defence vehicles that could soon be in the Indian Army, Navy or Air Force. From the houses of TATA Motors and Mahindra,' these defence vehicle can withstand bullets, float through water like a boat and boast some serious firepower! TATA Safari Armoured gets special bullet resistant glass, run-flat tyres and Kevlar floor padding! Aside from the GS800 TATA Safari, TATA Motors also makes a specially armoured version of their big 4x4. Visually, the armoured Safari looks no different from a stock car, although the big changes are in the skin (as opposed to under it). For one, the Safari gets NIJ Level 3 bullet proofing which means that every sheet is capable of withstanding six rounds of .308 bullets & 7.62mm FMJ lead core rifle ammunition. This Safari also boasts run-flat tyres and Kevlar mats to stop shrapnel from explosions under the floor pan from entering the cabin. All the extra load of the thicker sheets are borne by reworked axles. With a Turret mounted on the roof and armour all the way around, the TATA LSUV is what you get when an SUV and Tank have a love child! We reported earlier that the Indian army might be looking at a new Light-strike SUV for the ranks and in-field mobility. Thus far, the focus has only been limited to a specialised vehicle being manufactured by Force motors, but TATA Motors has also been working on a similar vehicle perhaps for the same purpose. This, especially considering that before the army acquires these vehicles they must go through the process of tenders. The vehicle which seems like it will be built around the TATA Xenon platform will have a roof mounted turret that can mount an MMG with 7.62 mm rounds or 40 mm AGLs or ATGLs. (Automatic Grenade Launchers) depending on usage and requirements. The SUV will also have STANAG 4569 rated bullet proofing which can take close-range automatic rifle fire or artillery fire from as close as 100 metres away The L-SUV also gets run-flat tyres with an inflation system that allows for reinflation of tyres from inside the cabin. 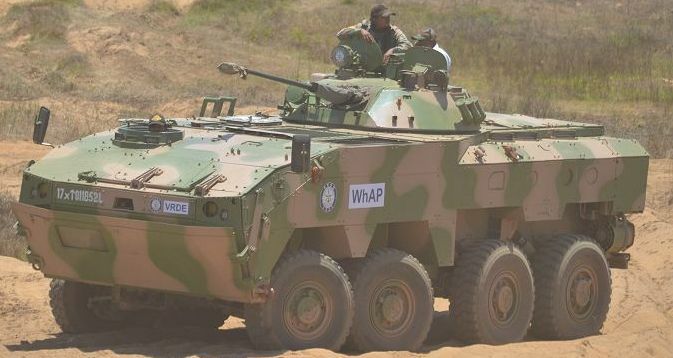 One of the more exciting vehicles that we have found during our efforts to uncover Indian Defence Vehicles, is TATA Motors WHAP (jointly developed with DRDO) which is capable of both on-road of going to battle on road and is also prepared for an amphibious assault by water through the use of a body mounted propeller. This Armoured assault vehicles can carry up to 12 people and has a roof mounted turret for attack. Not a lot of details are available around this vehicle but the Idea of an Indian amphibious vehicle is simply awesome! If we are talking about light-strike vehicles, one of the lightest around happens to be a Mahindra. The Mahindra Axe that looks to Polaris’ ATVs for inspiration, is powered by a 140 hp 4-cylinder Diesel Vehicle mated to a Mercedes-Benz transmission, making ideal for quick reconnaissance and reliable, fast access to the battlefield. Mahindra & Mahindra also say that the Axe is a modern combat vehicle and can even be armoured to protect against Automatic rifle fire depending on the requirements. The Marksman APC can carry up to 6 people, the design reminisce of a warthog makes it on APC you don't want to mess with! The Mahindra Marksman APC (Armoured Personnel carrier) is what you would get if a Tank and an SUV had a love child. 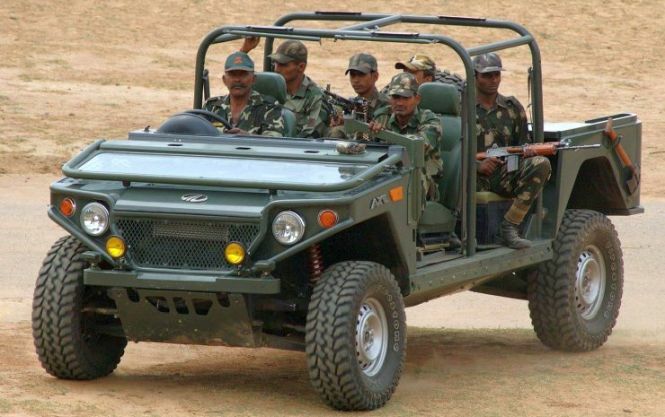 The 4+2 seater vehicle gets protection against small firearms discharge from point blank range and can have underbelly protection for grenade attacks as well. The APC has been targeted at Border Protection and Riot Control. The Mahindra Marksman has a Coppola machine gun mount with 270* traverse and protection. Five sides armouring of the passenger compartment (roof and verticals) to provide protection against 5.56x45mm SS109 ammunition. The Marksman Franken-truck is available with two engine options, a 2.6-litre CRDe with 115 hp and 228 Nm of torque or the more recent 2.2-litre CRDe motor with 120 hp and 280 Nm of torque. Like the TATA Safari, Mahindra also makes a specially armoured version of the Scorpio which is available with a full-hard top or based on the Mahindra Scorpio Getaway pick-up. With Armour, the Scorpio gets armour around all sides, which means that it can take close range Automatic rifle fire from close range. The Scorpio also gets Ballistic steel interior frame that provides overlap and backup protection for the doors and windows.